But then I discovered a basic fact. When dormant in late autumn and winter these grasses lose their purchase appeal, often ending up on the sales tables at nurseries. Out of season I was able to buy quite a few small pots of Hakonechloa and cram them together in a large terracotta pot. Perfect! And since that first lucky sale day I've done this several more times. 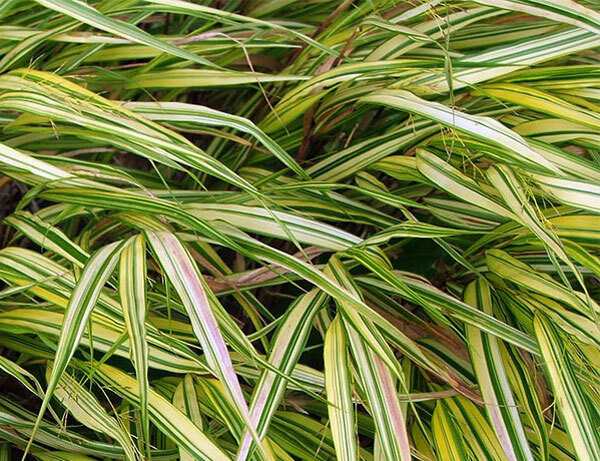 I continue to be a fan of planting Hakonechloa in pots. The grass falls softly down in a fountain, and this can look quite delightful in the middle of other garden flowers and foliage. The colour is fresh and light, with just a hint of lime, and the cascading effect doen't get lost - as it might at ground level. Hakonechloa is very slow to increase its girth, so doesn't demand much in terms of repotting either. It prefers garden shade and enough moisture. It's the perfect ornamental grass.